Go over, sideways and under on this magic carpet ride with First Act’s Centre Stage Program as we launch Disney Jr.’s Epic Production: Aladdin! We are really jazzed to jump into this show filled with fast-paced music, challenging choreography, imaginative costumes and scenery. With a staff of seasoned Theatre Artists and Theatre Interns, we have so much to teach and share with our students as we all work together to build an amazing show! 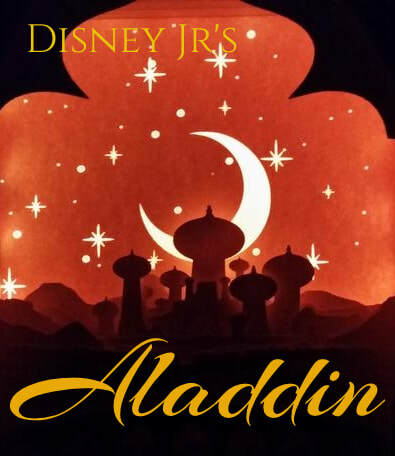 Based on the Disney Broadway touring production, there are roles for all levels of young performer abilities and ages—something to challenge and please everyone! NOTE: Students must be available for BOTH performances. We are pleased to offer tickets to this show free of charge in the Diane Ballweg Theatre in "The Stream" at Edgewood College! The family of each actor will be invited to reserve up to two tickets online for either the 4:30pm or 7pm performance, beginning 1-2 weeks before camp. Remaining reserved seats will become available for online reservation once camp has started. Donations will be gladly accepted at the door; all donations will go directly toward our scholarship fund. Thank you for your support!